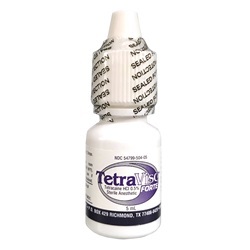 Tetravisc Forte, local anesthetic, tetracaine HCI 0.5% ophthalmic drops in 5 mL dropper bottle. Manufactured by Ocusoft. NDC Number: 54799-0504-05. Comes as singles.